“California Museums – Sites of Global Dialogue”: Museum directors Roxana Velásquez, San Diego Museum of Art; and Jay Xu, San Francisco Asian Art Museum, presented papers on what it means to be a global museum in California, 2011. “Expanding the Inquiry”: Fred Wilson, artist, and David Wilson, Director of the Museum of Jurassic Technology, in dialogue on museums at the Getty Museum, 2010. View the video of the dialogue. “Engaging Adult Publics: Museums Today and Future”: a workshop, which considered theoretical and pragmatic alternatives for engaging with adult publics in museums. Participants included Harvard University Professor Ivan Gaskell; Marla Berns, Director, UCLA Fowler Museum; Selma Holo, Director IM;I and Michael Brand, former Director of the J. Paul Getty Museum with Clare Kunny, Getty Museum, 2009. A video of the keynote lecture Art and Beyond: Some Contemporary Challenges for Art and Anthropology Museum is available for viewing. Dr. Gary Vikan, Director of the Walters Art Museum, in Baltimore led a roundtable discussion/seminar/intimate working group discussion on the topic of Museums and Inclusion, 2008. “Silences in the Dialogue Between Cultures: A Visit to the Musée du Quai Branly”: Sally Price, Duane A. and Virginia S. Dittman Professor of Anthropology and American Studies, the College of William and Mary, explored ways in which exhibitions at the Musee Quai Branly reflect the political positions toward the display of art in 21st-century France, 2008. 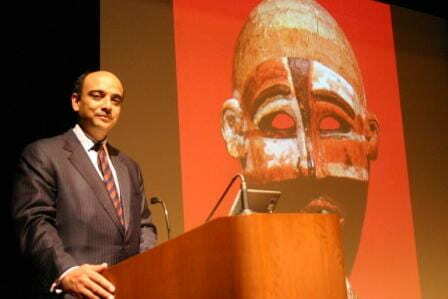 Princeton University professor Kwame Anthony Appiah defended the universal museum in his lecture, “Museums: Toward a Culture of Cosmopolitanism.” Getty Villa, Los Angeles. 2007. Princeton University philosopher Kwame Anthony Appiah believes art is best understood as cosmopolitan rather than tied to geography.